Isn’t this a cute little flower petal bag? I was cleaning out my art room yesterday and came across a stack of patterns that I had stashed away. I found this cute pattern from Valori Wells that I purchased at the Sisters Quilt Show a few years ago. I stopped cleaning the room at that point and pulled up the chair to my sewing machine. I chose these Mary Engelbreit prints and some red silk ribbon and started to sew. I made this in less than an hour! 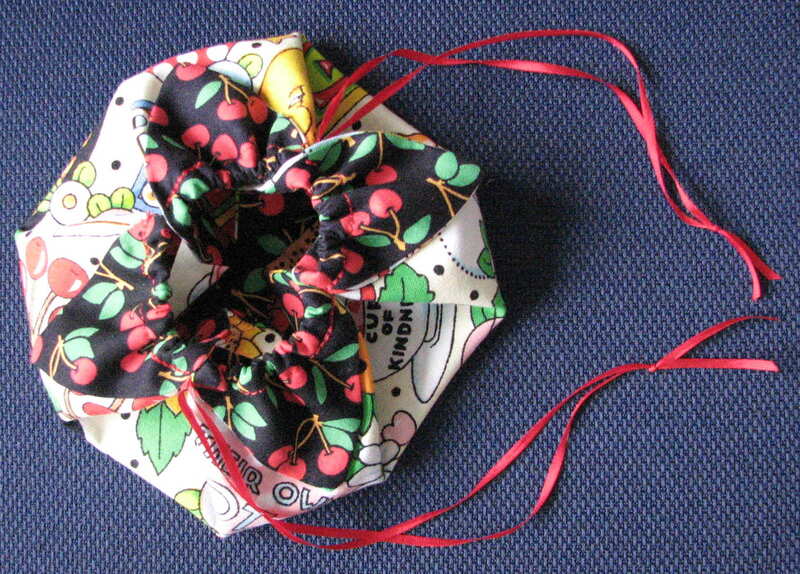 This could be a wonderful gift wrapping for a small handmade gift or it could be used as a small purse – just big enough to hold a lipstick, a hankerchief sprayed with your favorite perfume, a key and a few mints. Enjoy!! This entry was posted in 2008 and tagged sewing. Bookmark the permalink. This looks like a great swap idea. I love the surprises I find when I clean my space! Stuff I forgot I had. This is very cute!